Sometimes you want a new tattoo but you don’t want something big and complicated. This could be because you’re adding smaller pieces around an existing larger tattoo, or you just want a tattoo that’s cute and easily hideable. When approaching small simple tattoo ideas, less tends to be more. We’ve put together some small simple tattoo ideas to help you figure out what route to go for this kind of ink. Read on to get inspired for your next simple tattoo. Flower Tattoos – Flowers are extremely versatile in the tattoo world, and they just happen to make some of the best cute tattoo ideas. They’re a classic tattoo design, and are easily done in simple and minimalistic patterns. They can also be added to if you choose to expand your tattoo down the road. 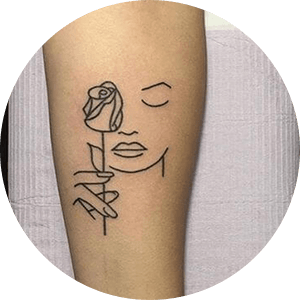 Some popular simple tattoo ideas for flowers include: a blooming flower, a flower with stem outline, a bunch of flower heads, and a flower silhouette. It’s up to you to choose which species of flower you want to use, and from there, how much of the plant you want in your tattoo design. Animal Tattoos – While they also work great for complex tattoo designs, animals can also make super cute tattoo ideas when done right. Small outlines of animal bodies, heads or paw prints are a few examples of cute tattoo ideas that fit perfectly with an animal theme. Animal skulls also work with as simple tattoo ideas, because they don’t need a lot of detail to be clear and visually appealing. Geometric animals are another kind of simple, cool tattoo idea that can be used to work with this theme. Micro Tattoos – When you think of small simple tattoo ideas, it’s likely that some kind of micro tattoo design is what comes to mind. Micro tattoos can make both cute tattoos and cool tattoo ideas, depending on the specifics of the design. Due to the size of these tattoos, they work best with less detail, because small areas that are saturated with complexity don’t tend to age as well as simpler ones. Micro tattoos are those that are the size of a quarter or smaller, so keep that in mind when you’re considering the specifics of what you want in your design. Hearts Tattoos – Possibly one of the top simple tattoo ideas, hearts can work with practically any style, size and complexity of tattoo design. Heart tattoos look great any way you choose to get them, whether they’re in black and grey, a simple outline, in color, a cluster or line of hearts, or as an accent to a large piece. If you’re on the hunt for a small, simple tattoo idea then a heart tattoo might be the best place for you to start. Outline Tattoos – In terms of simple, minimalist artwork, outlines make some of the best cool tattoo ideas. Simple outlines of just about anything can be into great tattoos, from animals and people, to flowers and plants, or even planets and space themes. Outline tattoos are especially great for abstract designs that are on the simpler side, such as a facial profile or a full body. Designs done in this simple style can pack more visual punch than a piece that’s huge and complexly detailed, as long as it’s done right. Silhouette Tattoos – Similar to outline tattoos, silhouette tattoos are another top choice for minimalist tattoo ideas. Silhouettes have more shading and bit more detail than outlines, while still remaining simplistic in the overall appearance. Silhouette tattoos are more about the absence of color to accentuate the shape that’s being outlined, leaving a lot of room for creativity of cool tattoo ideas using this style. Design ideas that work best with silhouettes include things like faces, facial profiles, human figures, animal bodies and faces, flowers, and simplistic scene work. If you’re thinking of small simple tattoo ideas, whether that be cute tattoo ideas or cool tattoo ideas, remember that in this case, size matters. The more complex you want your design to be, the bigger it will have to be, and at that point it enters into a different territory of tattoo altogether. Leave out any unnecessary details and keep things minimalistic if you’re going for a simple tattoo design, especially if you want one that’s smaller than the palm of your hand. Do you have a small simple tattoo idea? Let us know in the comments!